Located at the edge of Raanujärvi lake, this is the first building encountered when arriving on the Säikkäräniemi headland. Honka Säikkärä was built in 2008-2011. The main building offers accommodation for 16 persons. Large living room gives plenty of space to lay down. Outside you can watch the sunset and the lake from the terrace and become one with the horizon. When it´s time for some action, various winter and summer activities commence from the courtyard. In the courtyard there is an extra building for accommodation, which has four bedrooms for two with own showers and toilets. 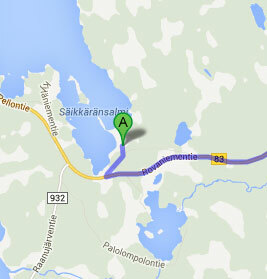 There is also a separate building containing traditional sauna, dressing room and a big Lappish grill hut. The cosy log-built villa takes care for its guests while respecting traditions in the appropriate manner. includes a modern electric sauna. 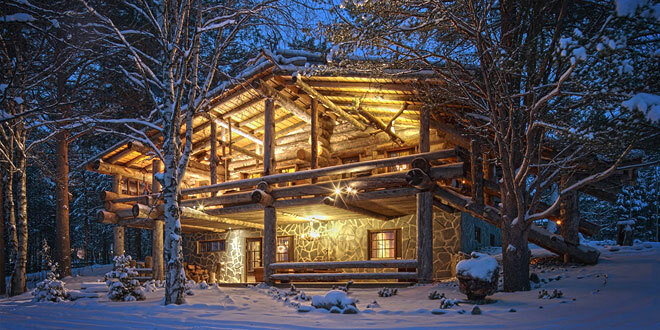 has a traditional wood heated sauna, a dressing room with fireplace, grill and cigar room. May be adapted to double rooms if required. Each room has shower room and toilet.